02 – Falling Down Again. 05 – Officer’s Mess (March). 07 – What’s ‘Round Here? (A Mystery). 09 – Carry On Crying. 11 – Eventually (Pop Song). 12 – Goodbye From The Okay Chorale. Go here to download the full album. Do you really rarely miss me? Relax fall back and I'll catch you. When I awake salute and I'll march. We're a nurse in uniform saying “This might hurt a bit”. Cry, Cry, Cry let me join you and I'll - Cry. Or is it sinking in? 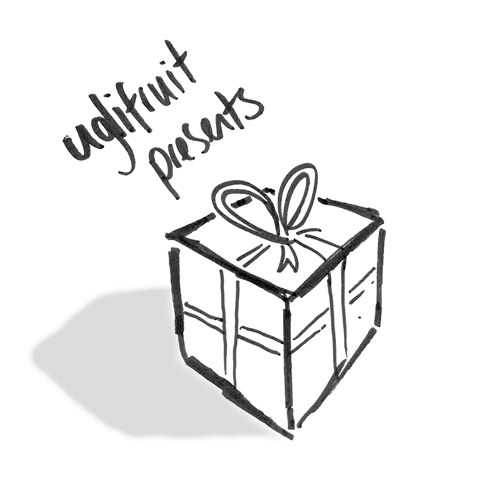 ‘Presents’ is creative commons licensed. Feel free to copy and distribute it. If you like the album so much that you wish to reply with a present of your own, then visit www.butterflypolite.com/uglifruit for details of how to donate, or buy the album on CD. 01 – My Prayer. Written and recorded 16th Feb.
02 – Falling Down Again. Written 17th/18th Feb. Recorded 17th/18th/19th Feb.
03 – Meteorites. Written 2nd/3rd Feb. Recorded 3rd Feb.
04 – Machiavellian Ways. Written 5th Feb. Recorded 5th/9th Feb.
05 – Officer’s Mess (March). Written and recorded 2nd Feb.
06 – Lullaby. Written and recorded 14th Feb.
07 – What’s ‘Round Here? (A Mystery). Written and recorded 22nd Feb.
08 – Feeling Confuzzzed. Written 19th/20th Feb. Recorded 20th Feb.
Come on Wembley, let’s see those hands in the air. As poppy as they come, including plenty of la la las to sing along with. I was very pleased with my Harrison-style slide guitar part ... but did he ever have to use a torch because he couldn’t find a slide? 09 – Carry On Crying. Written and recorded on 12th/17th Feb.
10 – Strictly Rehearsed. Written 13th Feb. Recorded 13th/14th Feb.
11 – Eventually (Pop Song). Written and recorded 1st Feb.
12 – Goodbye From The Okay Chorale. Written and recorded 22nd Feb.